One of the most powerful herbs you can add to to your herbal medicine kit is goldenseal. This plant, which is sometimes called yellow root, Indian turmeric, eye balm, ground raspberry, poor man’s ginseng, and wild curcuma, is indigenous to forests in the eastern United States near the Ohio River, the Pacific Northwest and Canada. It has a multitude of healing applications. Goldenseal is used as a natural remedy to treat rheumatoid arthritis, urarthritis, polygenic disorders, hemorrhoids, internal bleeding, enlarged prostrate, bronchial asthma, fatty liver, infections in the mouth and throat, tuberculosis and infected wounds. Its efficacy has not been scientifically proven, but one compound in the plant is berberine, an alkaloid known to be very effective in treating inflammations of the cornea and the iris resulting from herpes simplex virus infection. In a diluted infusion it can be used as an eyewash and a mouthwash, treating infected gums. A goldenseal infusion has been shown to improve certain types of psoriasis. The herb is also used to increase digestive secretions in the stomach, where it works through an astringent action on the mucous membranes lining the stomach, thus aiding in stopping the spread of inflammation. It is known to interfere with the absorption of nutrients, especially B vitamins, so it is not recommended for long-term use. Goldenseal is often used in preparations with Echinacea and holy basil. These preparations are known to treat a number of conditions. Echinacea goldenseal is particularly recommended to boost immunity and increase general well-being. All parts of the goldenseal plant can be used in herbal preparations. The roots, known as the rhizome, are the strongest part of the plant. They are dried and ground into a fine powder and generally packaged in capsules. 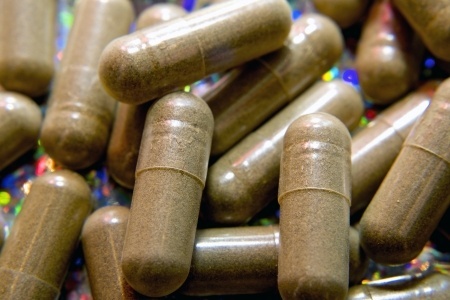 The capsules can be consumed orally, and the powder can also be applied topically. Goldenseal is also prepared an an emollient for topical application in treating wounds. Herbal tinctures of goldenseal serve as mouthwashes and gargles to treat sores in the mouth and throat. Herbal tea is another way to use goldenseal; it can be consumed or used as a topical antiseptic.